It is very important that during the inspection of the fan it is ensured that the fan is turned off and the power supply to the motor is cut. These measures must be taken to ensure that the fan doesn’t restart. 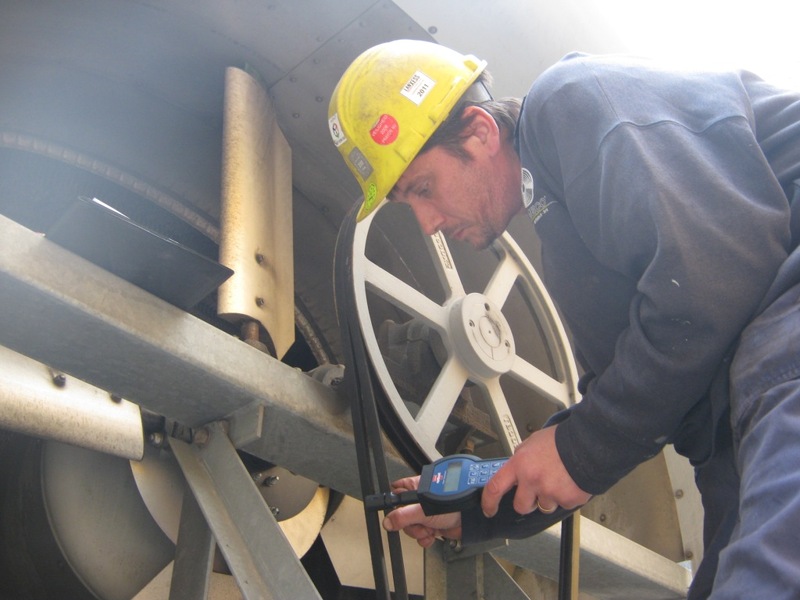 By performing an external inspection wear can be observed, but especially an internal inspection will indicate if the fan has been subject to wear. Especially fans that transport abrasive air will show wear. The drive elements, if present, can be subject to wear: the belt can fray, the edges of the pulleys can have worn edges... The wearing of the pulley edges will be rather felt than seen. Worn belts also impact the efficiency. Due to worn belts the transmission-efficiency will decrease. Shaft seals must always be inspected and the tread must not be forgotten. Fans are often used to transport corrosive air or air that contains abrasive particles. This corrosion appears also on the outside but particularly on the inside. The flow of air on the surfaces is interrupted by the damaged blades. This causes a decrease in transmission efficiency of the blades on the air. A severe corrosion of the blades can lead to a sudden problem. An equal corrosion is easily detectable, other forms are more difficult to detect (such as pitting on stainless steel). Fouling on the interior of the fan can provoke a decrease in capacity, especially when the inlet grids are clogged. This causes a decrease in pressure and a loss of energy. Fouling on the impeller can also provoke a significant decrease in the performance. This fouling is not evenly spread on the impeller, which can lead to an imbalance and will cause an increase of the vibration level. If damage of the fan casing or the fan base is noted, it is recommended to take measures as the robustness of the fan is affected and in long term this can provoke vibrations. A distortion of the fan casing will have a negative influence on the tip clearance when the fan is functioning. Like for all electrical machinery, the safe usage depends among other on the state of the electrical cables and the control. It is recommended to verify the state of the electrical cables, the couplings (water- and dust-tightness of the cable glands) and to control the functioning of the motor protection, the isolation switch and the emergency switch if these are present. The fouling of the motor can disrupt the cooling. The protection grid of the motor must always be free. The greasing of the bearings must be performed according to the maintenance instructions. The right dosage is important. Bearings mustn’t be too much greased. This is particularly important for bearings turning at a high speed. The tip clearance between the outer end of the impeller and the border of the fan casing of an axial fan, must be 0,5% (0,3% minimum) of the impeller diameter. The clearance between the impeller inlet and the inlet cone of a centrifugal fan needs to be bigger. In case of an irregular clearance, it is recommended to perform an alignment whereby the motor or the bearing block must be detached. When the fan is belt driven, it is good to verify the alignment regularly. It is recommended to control the lateral as well as the angular deviation. A laser alignment tool can be used but this is not necessary. A chalk line or ruler can also be used. 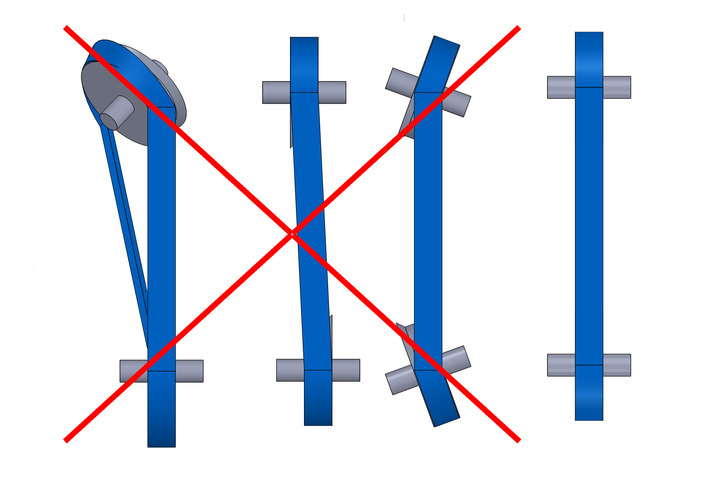 In the case of a flexible coupling the lateral and angular deviation must also be inspected. This is attainable with a dial micrometer, but a laser alignment tool is very useful in this case. But not only the defects in the fan can cause problems, it is possible to have problems with the connections too. Leakages in the system can cause a decrease in the efficiency of the system. These leakages occur mostly in flexible connections and in places where a lot of vibrations occur. Due to these leakages, less air is delivered. These leakages can be detected visually by inspecting the connections, the cracks and the tears. Leakages can also be detected with a temporary pressure measuring system.